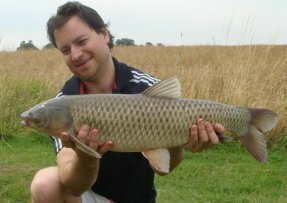 What is best weather conditions when fishing for carp? We've all experienced the way the UK weather can suddenly change when out fishing for carp. One day it’s too hot and the fish can be seen under the surface but just won’t feed. Then another day it’s windy with overcast skies and seems like perfect conditions but there’s no sign of them! Sometimes it’s confusing to know when it’s the best weather to fish for carp. The weather will influence temperature, wind direction, wind strength, air pressure and oxygen concentrations within the water. The state of these conditions will affect the location, as well as how, and when carp feed. A sudden change in weather can affect normal feeding patterns and cause us to find new areas to target carp. "When the wind comes from the West the fish bite best. When winds come from the East the fish bite least!" The strength of the wind is also important. To a degree the stronger the wind blows the better the carp seem to feed. The stronger the wind the more food items will be pushed in the direction of the wind by the current. This is one of the reasons why fishing with the wind into your face can be more productive. It has been stated that an undertow current will carry suspended food particles back in the opposite direction. I feel however, that this will only cause it to travel back a little. Many features within the lake such as weeds, gravel bars, varying depths, etc, will help to hold food items from travelling back with the undertow. I also read once that at the windward bank side, a strong wind can push the thermo cline layer further down towards the bottom. Because carp will often follow the warmer layers of the water, a strong wind helps push more carp to the bottom and therefore closer to angler’s bait. I think one of the biggest influences for a carp to feed is the warmth of the water. The optimum water temperature for feeding is around seven degrees centigrade. The more the water temperature drops below this level the more they tend to slow down and prefer to shoal up in warmer areas or any thermal layers present in the water. For this reason location of carp is probably the most important part when fishing for carp in the cold season. The temperature of the air and water will have a major impact on the location and possible feeding of carp. Air temperature will have an eventual effect on the temperature of the water, so for this reason they are related to some degree and can affect how the carp will behave. If the weather suddenly goes cold it doesn’t necessarily mean the water temperature will immediately drop. The air temperature will often have to stabilize and remain cold for a few days in order for it to transpose through to the entire water depths. Therefore, the deeper a lake the more time it takes to change the water temperature. Carp love to be warm so they’ll generally seek out the warmer thermal layers of the lake. Thermal layers will be present in most lakes, especially the deeper, high water volume lakes. The depths of these thermal layers will also vary depending on the depth of the water and the temperature of the air. Shallow water pools may be devoid of its thermal layer, but if it receives direct sunlight it will warm up much quicker than other parts of the lake. Therefore, on a cold winters morning carp often head for shallow areas that receive direct sunlight, even if there are thermal layers within the lake. Air pressure is an important point to consider when thinking about fishing for carp. The air pressure will ultimately affect the level of oxygen in the water. Carp need oxygen to function properly, including searching for food. If the water oxygen levels are low carp tend to become sluggish and lazy, it’s like they cannot get enough energy to feed. High pressure usually means a warm spell which doesn’t replace enough oxygen that is being used up by fish, plants, etc. Low pressure often means wind and rain, which will oxygenate the water. This is why it’s much better to fish for carp on days when air pressure is low. I will always try to go fishing when the pressure drops, even if it means fishing in heavy rain. I feel it’s worth being a little cold and wet if it means a greater chance of catching bigger carp. Look for an air pressure reading below 1000mb as this is considered low pressure. A reading above 1010mb is considered high air pressure. The problem with today’s climate in the UK is that there seems to be many more days with high pressure, even during rainy days! The air pressure will ultimately affect the depth at which the carp will be. I once heard a famous carp angler state that, generally, in high pressure carp tend to be higher up in the water, and low down on the bottom during periods of low pressure. This is an interesting point as it gives us a general idea about location, usually we try to locate the area of carp before choosing a peg, but many carp fishermen don’t think about locating the depth of water carp may be holding up in. I have seen loads of carp anglers using bottom baits on a hot summer’s day when the pressure is very high, then wonder why they aren’t catching. At a push they may use one rod for surface baits. In this situation I think a better tactic might be two rods on zig rigs at varying depths and the last on the surface. If we can understand why carp are located in different areas then we can adapt our tactics to achieve a better catch rate. The most important thing to remember is that all these conditions are inter-related – wind, air pressure, temperature and oxygen levels. However, I think no matter how bad the weather can get it still needs to be stable a few days before going carp fishing. I feel the sudden chopping and changing of the British weather is causing problems for carp fishermen in the UK.